Buying jade jewelry is increasingly popular with both talented amateurs and souvenir hunters. However, while it was once comparatively easy to pick up a cheap piece of jade jewelry for a low price in places like Hong Kong and Taiwan times (and prices) have changed. Getting a good deal of jade is increasingly difficult. Hong Kong and Taiwan remain the center for the international jade trade but the market is now flooded with imitation jade (often being passed off as genuine) – and lower quality stones. There are very few genuine bargains available. That's all the warnings out the way. If you have your heart set on a statement-sized piece of jade jewelry, Hong ​Kong and Taiwan are still the best place to look. Jade remains important to several Chinese superstitions and traditions. This popularity means the markets in these two locations remain the most competitively priced. As with anything you buy - especially if it’s a large investment - make sure you know what you want. There is a huge variety of jade, from yellowish and opaque stones to the deep green that people more readily associate with the gem. Different types attract different price tags (deep green and white jade attract the highest prices and are relatively rare). Whichever type of jade you are interested in buying, be sure to check the prices at high street jewelers in your home country and wherever you’re buying the jade. This will give you an idea of the market value of certain pieces and allow you to make smart decisions about the price when negotiating at a market or jade trade show. This is a really simple tip but it still seems to catch a lot of folks out. If a seller is offering a stone for well below market price, claiming it’s pure, deep green jade and/or thousand of years old, just walk away. Many sellers at jade marketplaces will take advantage of a buyers lack of knowledge. These sort of bargains don’t exist. Scams on the other hand do. We don’t purport to be jade experts, and if you are making any sort of major investment in jade you certainly need to get the piece checked out by an independent expert (see certificates further down the list). 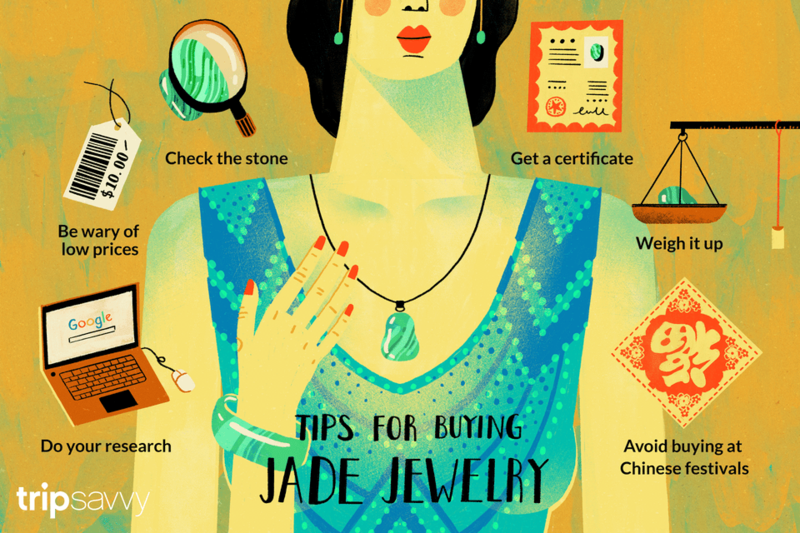 That said, there are some tips that can help you spot real jade. The stone should be smooth and cool to the touch. Real jade is also very tough, so there should be no scratches on the surface. If you can scratch the stone with your fingernail, it’s an imitation. Similarly, if the seller won't let you run the fingernail test, then there is a good chance the stone is fake. You'll need to have held real jade in your hand for this tip (try a high street store) to work. One way to tell if the jade is real or not is by the weight - imitation jade will usually be a lot lighter than the real thing. For a big-ticket piece of jade jewelry, the seller should be able to offer you a certificate of authenticity. This is jade that has been scanned and checked by an independent expert. The classification runs from A-D and is used internationally. Unfortunately, most sellers will only pay for certificates for Grade A jade, but you can ask for a certificate and cover the cost yourself. It’s worth noting that all grades, from A-D, are ‘real jade’. It just indicates differing quality and value. In grades B and C the jade has usually been treated with chemicals and may have had color added to make it appear a deeper shade of green. Glass, plastic and all other sorts of minerals are used to create imitation jade, while the lowest opaque jade can be relatively inexpensive. As long as the seller is upfront about exactly what they are selling, and you are comfortable with what you are getting, there is no reason you shouldn’t pick up a piece of imitation jade. Some of the pieces are very attractive. If you are purchasing jade in Hong Kong or Taiwan, don't try and buy just before a traditional Chinese festival. Prices will be at a premium. Instead, head to the market just after festival time when business has slowed down and you have a better chance of talking the seller into giving you a deal.